Lieon Kit, BSc. 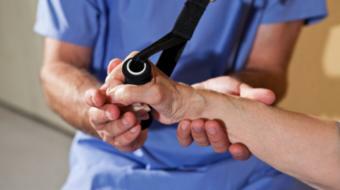 PT, IMS, Physiotherapist, discusses hand arthritis treatment with a physiotherapist. Treatment for Hand Arthritis Lieon Kit, BSc. PT, IMS, Physiotherapist, discusses hand arthritis treatment with a physiotherapist. Well hand arthritis is basically known as just inflammation of the joints and the surrounding tissues in the fingers and also in the hand, there are so many joints in the hand and the fingers. There’s usually two types of arthritis that we encounter: either osteoarthritis or rheumatoid arthritis. The difference between osteoarthritis and rheumatoid arthritis is that with osteoarthritis it generally happens with age and as a general wear and tear of your joints from deformity or just overuse. With rheumatoid arthritis, that usually happens within our body defenses attacking our tissues, it’s also known as autoimmune response. People that are mostly affected by osteoarthritis are usually older individuals, usually also women are more likely to get osteoarthritis than men. With rheumatoid arthritis again, women more than men are known to get rheumatoid arthritis. That can happen anytime. Some of the symptoms of both osteoarthritis and rheumatoid arthritis include definitely pain, possibly swelling, redness around the joints. Having difficulty grabbing or holding things, you might see some joint deformity, even changes to your muscles and other things. In physiotherapy for hand arthritis they tend to do more in the way of exercise to strengthen and improve the flexibility around the joints of the hand and fingers. Also they provide splinting of the hand to prevent deformity, also they may provide heat and cold modalities, and patient education for proper pain management of your hands. If you have any questions about the hand arthritis that you may have, it is important to follow up with your physician or physiotherapist to get the correct diagnosis early to prevent the symptoms from getting worse.